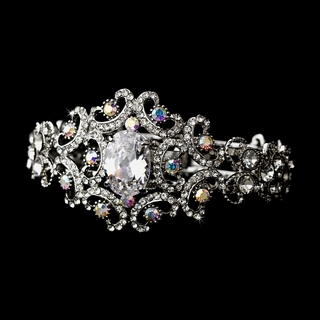 Our "Confetti" bracelet features dazzling clear and AB-Reflective crystals in an ornate silver-plated setting. It is adjustable to fit most wrist sizes. This ornate bracelet looks beautiful with both white and ivory wedding dresses, and would also be the perfect accessory for any ensemble in need of a little sparkle! Size: Cuff-style bracelet with an inner circumference of 7-3/4"